﻿ Ulf Kirsten: "As a striker, Mario Gomez is better than Cristiano Ronaldo"
29.12.2011» Ulf Kirsten: "As a striker, Mario Gomez is better than Ronaldo"
Cristiano Ronaldo started his professional football career playing as a natural winger, but over the years, he has been assuming more of a forward/striker role in Real Madrid. In a talk to "Bild", Ulf Kirsten ranked Mario Gomez as the best striker in the World, even when forced to compare him with Cristiano Ronaldo. The former German striker, Ulf Kirsten, granted an interview to "Bild" this week and shared his somewhat unusual view, regarding who is the best football striker in the World right now. As a good patriotic German, Kirsten revealed that his fellow countryman and Bayern Munich player, Mario Gomez, is the best striker there is on this sport, even if we compare him against Real Madrid superstar, Cristiano Ronaldo. Ulf Kirsten: "Regarding exclusively strikers, Mario Gomez is the best that football has to offer right now, in both Europe and Worldwide. In my opinion, Gomez is even at a higher level than Cristiano Ronaldo in that position. I think that he can still improve his game, since he's only 26-years old and he has also already proved he has what it takes to get through harsh times", noted Kirsten, when referring to Bayern Munich's forward, who has been a victim of many critics in the past years for not performing in the way it was expected (in the 2009-10 season, Gomez scored only 14 goals from 45 appearances). 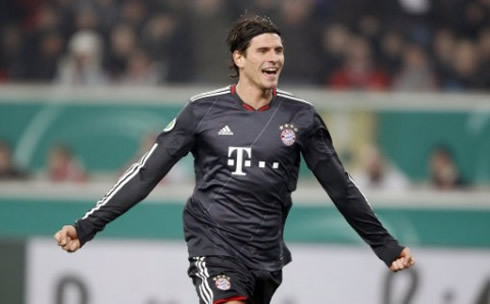 However, Mario Gomez seems to have found his best game this year as he has been faultless during the current season. His recent nickname, "Mr. Reliable", appears to fit better than a glove and even the German all-time legend, Gerd Muller, spoke out a few words to praise Gomez recent performanecs. Muller: "At some point, he will beat my record of 40 goals in a season", prophesied the former German player. Both Real Madrid and Bayern Munich got through to the UEFA Champions League last 16 stage, so a clash between the two clubs, as well as Cristiano Ronaldo and Mario Gomez, is still a possible scenario. On a side-note, Iker Casillas suffered an allergic reaction this past Wednesday, during his presence in the "Partido de la Ilusión", an agended match to raise funds for charity, that was held in Madrid. The Merengues goalkeeper showed his great character and didn't hide from the cameras, despite his face being all swollen. 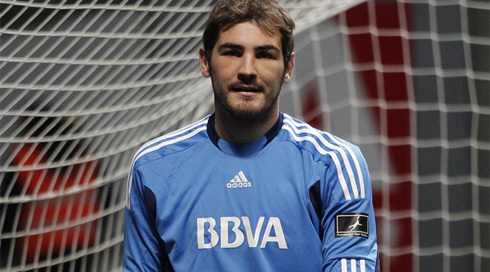 Casillas: "It looks like I fought against Rocky Balboa! Or maybe I just picked a fight with 20 guys at the same time...", joked Real Madrid's captain with the situation and showing his good sense of humor in front of a big crowd. Real Madrid next match is against Malaga for the 1st leg of the Copa del Rey, in the 3rd of January 2012. The club is expected to return to training this Thursday (29-12-2011). This weekend, you can watch Chelsea vs Aston Villa, as well as Liverpool vs Newcastle and Manchester United vs Blackburn Rovers, all games for the English Premier League. All these matches will be available from our football live streams section.